UNSOCIABLE AND UNSUSTAINABLE | "Global Possibilities"
Residents in luxury buildings are rarely swayed by the economic calculus of saving energy. The Met, Bangkok. Photograph by Richard Lee. Wong Mun Summ, Richard Hassell, and Patrick Bingham-Hall. Garden City Mega City: Rethinking Cities for the Age of Global Warming. Pesaro Publishing, 2016. The Met, Bangkok, Thailand. Completed 2009. Trump Tower, Mumbai, India. Under construction. A few months before the world’s tallest building, the Burj Khalifa, opened in Dubai, I sat down with the man who designed it, Adrian Smith. We were a long way from the Middle East. Meeting on the High Modernist campus of the Illinois Institute of Technology, just a few el stops from his office in Chicago, Smith exuded the confidence of the mid-twentieth century that had so influenced his architecture. It almost seemed he’d teleported from that era into ours, retaining its black-and-white-TV palette—pale skin, white hair, black suit, black belt, black shoes. Last year, I spoke to the co-principals of a Singapore-based firm that sees architecture’s mandate from a different perspective: looking up from the Global South rather than down on it. Since its founding in 1994, WOHA—named after its founders, Wong Mun Summ and Richard Hassell—has embraced the unfashionable mission of forging scalable designs to avert climate change in the developing world. WOHA’s airy, perforated towers dot Singapore’s skyline as well as Asian megacities from Mumbai to Shenzhen, all of which share the challenges of breakneck urbanization in a tropical or sub-tropical climate. This year, the firm published a manifesto, Garden City Mega City: Rethinking Cities for the Age of Global Warming, and won wider notice through a pavilion show at the Venice Biennale and its first American retrospective, at the Skyscraper Museum in Lower Manhattan. Self-described “tropical architects,” Wong and Hassell are working to craft what they call a “prototypology,” or series of new building forms, for Asia’s fast-growing cities. The firm’s usual strategy is to build tall but thin. Height is a necessity given the spike in urban population—Jakarta, Delhi, and Dhaka have all tripled in the past twenty-five years. But by building towers just one unit thick and incorporating specially designed windows that let in wind but keep out rain, residents can rely on cross-ventilation rather than energy-wasting air-conditioning. To cool buildings and prevent heat islands, WOHA’s roofs and walls are planted with greenery, often resulting in a total square footage of green space many times the size of the original undeveloped plot. WOHA places planted sky terraces every few stories to preserve a sense of community in what are otherwise massive developments. And instead of separating uses in the modernist tradition of purely residential towers linked to office towers by expressways, WOHA stacks commercial, residential, retail, and recreational uses within the same building to minimize time- and energy-wasting travel. For those trips that are still necessary, WOHA projects are, whenever possible, sited above metro stops. WOHA’s Garden City Mega City is far more ambitious than the glossy laundry lists of best practices that most firms put out. Designed as a dos-a-dos book, flip-flopped with two front covers for its two co-equal parts—one outlining the problems of mass urbanization and climate change and the other offering solutions—WOHA’s manifesto begins not with quibbles over mainstream design but with a disquisition on global inequality. If current trends continue, Wong, Hassell, and their coauthor Patrick Bingham-Hall note, 2016 will be the year in which the world’s wealthiest 1 percent cross the threshold to possessing more wealth that the bottom 99 percent combined. It’s a problem for the design world, they explain, because of the power of the 1 percent to hijack the design conversation, tasking their architectural handmaidens with inane tasks like putting helipads on skyscrapers instead of creating functional, sustainable cities. Grotesque inequality allows “free-market greed [to] thwart . . . big-picture political thinking.” The structures that result from this inequality don’t just ignore climate change—they exacerbate it. Consider the disquieting case of Bangalore. In the Indian tech boomtown, which had fewer than a million people at independence but is now more populous than New York City, Western architecture has created climate change in a single city. Near the equator but high on the Deccan Plateau, Bangalore once boasted a climate of eternal spring that lured educated workers from all over India. As the architectural typology of the Silicon Valley office park was imported, scattering glass boxes and lawns across a sprawling exurbia, the city’s water and energy use jumped. Maintaining all those lawns and providing water for a growing population with increasingly middle-class consumption habits required digging borewells deeper and deeper into the ground, ultimately sucking the land dry. Bangalore’s water table has dropped from 30 meters below ground twenty years ago to 500 meters today. The water table is now so low that large trees can no longer tap it with their roots, making it impossible to plant new shade trees. Without shade trees, the city becomes a giant heat island, which requires the office buildings to further pump up their air-conditioning, which in turn requires more energy from coal-fired power plants, which in turn . . .
A truly sustainable city, Wong and Hassell write, “will require much more than the insertion of sustainable components.” It will require a reengagement with citywide environmental thinking and planning that grew out of the energy crisis in the 1970s but got waylaid, as they put it, during the “‘greed is good’ comfort zone of the late 1980s.” Rather than take seriously the high-end projects in the West’s “precincts of affluence” that brand themselves “sustainable”—a term the authors condemn for being “used so often and so lazily” that it has become “a tiresome cliché”—WOHA suggests replacing the word with the more severe, but appropriate, “survivability.” The stakes, then, are clearer: How should we build and plan in order to make it out alive? For building on a grand scale, the firm’s hometown, Singapore, the world’s wealthiest tropical city, is an ideal testing ground. Governed under a controversial communitarian system in which over 80 percent of the population live in public housing projects, mass residential developments are still common commissions in the city-state even as they have gone out of fashion in the West. Singapore’s public housing blocks permit WOHA’s innovations to be tested on a mass scale. I got a sense of how this all works when I visited the firm’s recently completed Singapore public housing project, Skyville@Dawson. I walked to the elevator bank, a freestanding central shaft linked by sky bridges to the wafer-thin residential towers. Stepping out on the top floor (number 47), a powerful breeze cooled me immediately. Even in the hottest and most humid climates, a few stories above the ground, the air is significantly cooler and drier. By taking advantage of the air-pressure gradient between the warm humid air at ground level and the cooler air above, WOHA’s buildings make the most of the heat-stack effect, creating vertical breezeways that channel updrafts to cool their buildings’ public areas. The monsoon window, which is deployed in all 960 homes at Skyville and which WOHA is attempting to mass-produce in India, is simple, inexpensive, and potentially revolutionary. Its design is based on the ventilation openings built into traditional tribal longhouses on the island of Borneo, which operate on the same principles—albeit using opaque wood in place of transparent glass. People learned long ago how to live in tropical environments, even if most Western architects don’t care. WOHA has merely rediscovered this fact. WOHA sees its mandate as social as well as environmental and Skyville’s design strives to create small-scale communal spaces with a “Sky Village” terrace every eleven stories. The bulk of Asia’s urbanites move to cities from villages, unceremoniously thrust into a disorienting new world, and these communal spaces try to relieve some of the anomie of the megacity. The sky terraces provide places for young children to play under quiet supervision as the apartments are all laid out so an adult can oversee the scene through a window. The signs that demarcate these spaces—“Village 5. BLK 87.”—can seem a bit Soviet in their forced camaraderie, but at least WOHA is engaging with the right questions. A hundred years ago, every serious architecture firm had a position on what was then simply called “The Social Question”—how can a multicultural, class-stratified populous humanely share a city? Today, when the problems are global and quite possibly terminal, the profession is oddly silent. Considering the firm’s myriad Singaporean successes, it is notable that outside its hometown, with its unique communitarian system, WOHA seems unable to impact a city no matter how generous its construction budget. Residents in luxury buildings are rarely swayed by the economic calculus of saving energy and, in cities without comprehensive urban planning, even the greenest project cannot function in a sustainable way. 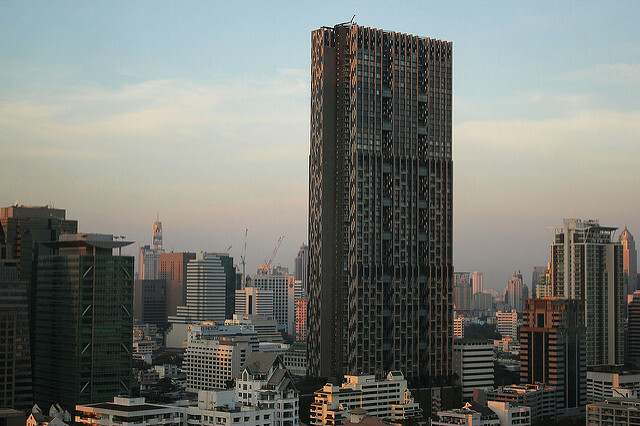 In Bangkok, I visited The Met, WOHA’s perforated, domino-shaped condominium tower that overlooks Sathorn Road, a thoroughfare the building’s sales agent told me was “number one in traffic jams.” I’d caught a cab over from the nearby park when a rainstorm hit and found myself stuck in the gridlock. Looking out the rain-smeared window, I muttered that I could have walked down this street faster if only its sidewalks had been built with the sheltering overhangs that were once standard for cities in this climate zone (as one can still see in Mumbai’s historic Fort District and New Orleans’s French Quarter.). Though located in the most amenity-rich neighborhood in the city, The Met is so cut off by the eight-lane Sathorn Road that simply going to the cinema across the street requires vehicular transportation. The penthouse comes with fully five parking spaces. WOHA claims that by topping The Met’s nine-story parking garage with “a relaxing resort-style garden and a fifty-meter swimming pool” they “co-opted” the parking structure, but it seemed more like an example of how green design is so often co-opted for branding in the West. As I read Wong and Hassell’s description of elite cocooning in their manifesto—“we must acknowledge that many of our cities have become unsociable and unsustainable places to live, no matter how commodious one’s residence may be”—it seemed they were unwittingly describing their own building in Bangkok. The authors intended their flip-flop manifesto to be read as a dispiriting litany of problems followed by an inspiring catalogue of solutions. But reading the 400-page book, it was its emotional impact that felt flip-flopped. The section on solutions read like a laundry list—some innovations (the monsoon windows) were spot on; others (the sky terraces) ineffectual—while the first half of the book, dedicated to problems of urbanization and global warming, read like a call to arms. Seeing the problems of 21st-century urbanism laid out so clearly and comprehensively, from their roots in global inequality to the lived reality of the Global South, was riveting. Why had no one done this before? Why did WOHA see what its Western peers couldn’t? Wong and Hassell put density and climate change at the center of their agenda because Singapore’s unique socio-economic realities had placed it there for them. Many of WOHA’s first “prototypologies” were conceived in a 2001 architectural competition for a Singapore housing project that the firm didn’t even win. But even in losing that commission, simply having a paying client ask a young firm to create mass affordable housing was formative. It was the kind of architectural competition that architects in Western societies, most of which long ago gave up on building public housing, never have the opportunity to enter. The global vogue for “sustainability” has lulled us into assuming architects will come up with innovations to overcome the environmental crisis through their sheer brilliance. But this bespeaks a naive faith in reason and human ingenuity that ignores power. As WOHA’s manifesto and career show, architects come up with solutions to the problems they’re given; they do not set the agenda. When given a task by Singapore’s public housing authority, Wong and Hassell do innovative, meaningful work. When their tasks are set by the Trump Organization, they get steamrolled by global inequality just like everyone else. If, as WOHA has convincingly argued, the environmental crisis is an outgrowth of the global inequality crisis, our choice is to solve both or solve neither. Opting for the latter, an increasingly likely possibility, has consequences that are unthinkable but, alas, not unlikely.